Last week, retired Immigration Judge Nathan “Nate” Gordon passed away. At his funeral, dozens of immigration attorneys, judges and others shared their stories of this wonderful man. Judge Gordon changed many people’s lives in a very positive way. I have a lot of stories about Judge Gordon. Let me share one of them with you. Judge Gordon was born on Christmas Day in 1926 in New Jersey to Jewish immigrant parents from Eastern Europe. He served in the US Army during World War II and graduated from New York Law School some years later. He was employed by the U.S. Immigration and Naturalization Service (INS) as an Attorney from 1962 to 1977. After that, he became an Immigration Judge, first in Newark, New Jersey, then in Los Angeles. I first met Judge Gordon in the mid-1980s, after I had left the INS and entered private practice. The tremendous amount of compassion that he had for immigrants was truly impressive. It trumped all legal standards. If he believed that a person deserved to stay in the US, Judge Gordon would find a way to make it happen. I remember getting a phone call one day from Congressman Mervin Dymally’s office. It concerned a young man born in El Salvador. He had been brought over the U.S.-Mexican border by his mother when he was 14 years old in order to save him from the violence of the civil war which was raging in their native country. They were immediately arrested and taken into custody by the Border Patrol. Though they were later released on bail, the experience was so stressful for his mother that she died of a heart attack a few weeks later. The young man, Miguel Perez, not knowing a single word of English, was placed under deportation proceedings. The process took years. Ultimately, his application for asylum was denied by an Immigration Judge. The Board of Immigration Appeals (BIA) affirmed the Judge’s decision. By this time, Miguel had not only mastered the English language, he had become an honor student at a local university. In his spare time, he tutored underprivileged children in South Central Los Angeles. After learning of the BIA’s decision, he packed his bags and got ready to book a flight to El Salvador. However, his professors and friends, horrified by the thought of what might happen to him if he returned to El Salvador, urged him to speak with his local Congressman. The Congressman’s office arranged to have Miguel meet with me. The next day, his story appeared on the front page of the Los Angeles Times. We immediately appealed his case to the U.S. Court of Appeals for the 9th Circuit which overturned his denial. Miguel was scheduled for a new hearing before an Immigration Judge. Miguel had, by this time, lived in the U.S. for more than 7 years. Under a law which existed at that time, he could apply for a green card through “suspension of deportation”. He would need to show that he was a “person of good moral character” which he clearly was. He would also need to demonstrate that he would suffer “extreme hardship” if he were forced to return to El Salvador. This was a discretionary determination. What he needed was a compassionate Immigration Judge. Fortunately, the Judge who had ordered Miguel deported had retired. By a great stroke of luck, Miguel’s case was transferred to Judge Gordon. From my previous experiences with Judge Gordon, I was certain that he would find that Miguel would suffer extreme hardship if he were forced to return to El Salvador. I scheduled a meeting with the INS District Director. I explained the facts of the case to him. 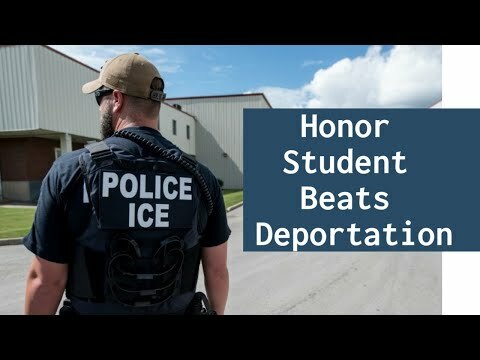 Did the government want to look like bad guys eager to deport an honor student? Or would he consider having the government’s attorney tell Judge Gordon that they agree that Miguel’s application should be granted? The District Director agreed that Miguel should be granted suspension of deportation. I told the District Director that there would be dozens of reporters and TV cameramen waiting outside the courtroom. At the hearing, we requested that Judge Gordon grant Miguel’s application for a green card. Judge Gordon then asked the government attorney what their position was. She told him that the government agreed that Miguel’s application should be granted. Judge Gordon smiled and proceeded to grant Miguel’s application. Had Judge Gordon not been assigned to the case, I doubt that the government would have agreed prior to the hearing that Miguel’s application should be approved. Miguel went on to get a Ph.D and became a distinguished professor at a public university. He is married and is a great husband and father. As I watched Judge Gordon’s casket being lowered into his grave last week, I thought about the thousands of immigrants like Miguel whose lives were altered in such a positive way by Judge Gordon. Judge Nate Gordon was truly a Supermensch. Last edited by CShusterman; 01-15-2019, 01:21 PM.